The Nike Basketball Battle Grey Collection includes the Nike Kyrie 2, Nike LeBron Soldier 10 and the Nike KD 9. Celebrating Kyrie Irvin’s first NBA championship while preparing for the new season is the release of Nike Kyrie 2 “Battle Grey” colorway. 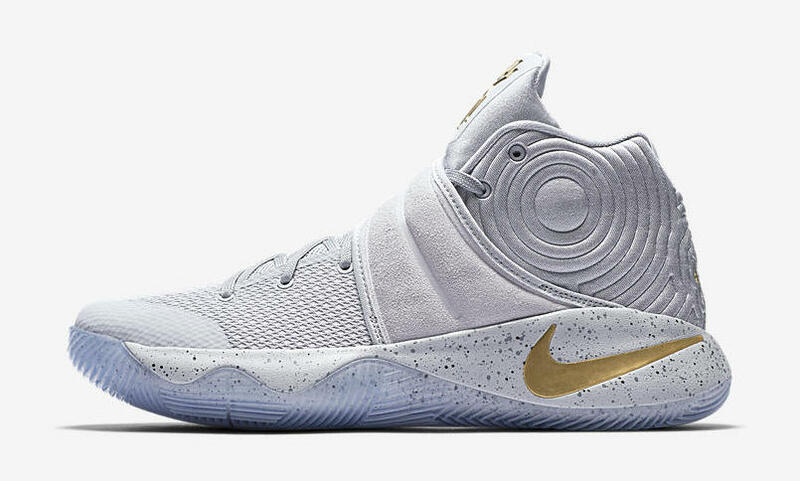 This Nike Kyrie 2 features a tonal Grey upper done in Wolf Grey with Metallic Gold accents, Race Blue speckles sitting atop an icy outsole. Elevating LeBron James’ sneaker that earned him another championship is the Nike LeBron Soldier 10 “Battle Grey” release. This Nike LeBron Soldier 10 was worn during the Cavs ring night. Featuring a mesh and nubuck upper with speckled accents on the three straps, along with Metallic Gold accents and icy outsoles. As a nod to the “Dark of the Unknown” and the “Light of Potential,” Nike Basketball will be releasing the Nike KD 9 “Battle Grey” colorway. This release comes dressed in a Wolf Grey and Dark Grey atop an icy outsole. Look for the Nike Basketball “Battle Grey” Collection to release on Saturday, October 29th, 2016 at select Nike Basketball retail stores. The retail price tag is set at $120 to $150 USD.